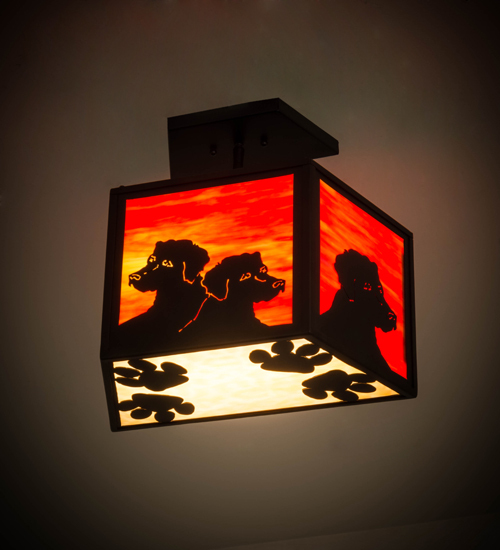 Description: This charming ceiling fixture features Labrador Retriever dogs on Sunburst colored art glass side panels and paw prints on the Beige art glass bottom diffuser. The fixture is enhanced with a frame, hardware and decorative accents in a Solar Black finish. Custom crafted in the Meyda facility in Yorkville, NY, the flushmount available in custom styles, colors and sizes, as well as dimmable energy efficient lamping options such as LED. The fixture is UL and cUL listed for damp and dry locations.